Eugene (Aug 11)--Deborah Ellen Frisch (aka Oregon Criminal #1675174) has indicated that she will move to delay her probation-violation hearing, scheduled for next Monday in Lane County criminal court. 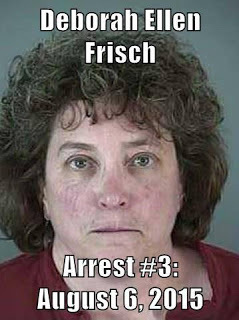 Miss Frisch faces the imposition of a 105-day jail-sentence if she is found in violation of her probation. She has already been found in violation once, after a hearing on June 10th. In that hearing, Miss Debbie pleaded guilty/no-contest to charges of making a false statement and violating the condition of her probation requiring her to receive a psychiatric evaluation.